We had a group of twenty, we had the sea, we had clear horizons. The only thing missing was the Sun. We flew to China via Finland accompanied by three large groups: 78 from Finland, 30 from Spain and about 25 from Poland. As we flew over Siberia we realised we were above Novosibirsk where we saw the 2008 eclipse. The airport at Shanghai (the name means "on the sea") is separated from the city by the 300km/hr Maglev train (magnetic levatation), an exciting ride. Our hostel was in a busy and lively part of Pudong the newer part of Shanghai. The ferry across the Huangpo River was lively with boats, ships and other seaworthy craft rushing by overlooked by tall modern skyscrapers. Shanghai's busy shopping street, Nanjing Road, was - well, busy. Shanghai is busy - it takes a long time to go anywhere and the heat and humidity were debilitating. We took the one hour train ride to the city of Suzhou. This has its historic centre almost intact (unusual in China). We wandered its tiled houses and canals. We visited the Silk Museum as this was China�s main silk producing region. We saw silkworms (actually a type of caterpillar) munching mulberry leaves and cocoon spinning. I then climbed the North Temple Pagoda. Suzhou is famous for its gardens and we saw the largest, the Humble Administrators Garden. This UNESCO World Heritage site has ponds, pavilions, bamboo groves, lilies, fish and rock formations. It was 40 degrees and very hot again another sunny day. We slowed down and ended up at the Temple of Mystery where local students wanted to be photographed with us. Eclipse day dawned cloudy and misty over Shanghai. After six days of sunny clear mornings and hot, steamy sightseeing, the one day we wanted Sun, it was nowhere to be seen. Twenty of us from nine countries (UK, USA, Australia, Sweden, Netherlands, France, Japan, Taiwan and China) set off for the beach at Jinshan, about 60km away. It remained misty and cloudy. The beach was demarcated out for various groups. We positioned ourselves on some decking close to the sea in the area adjacent to a Thai princess. 8:23 was first contact. 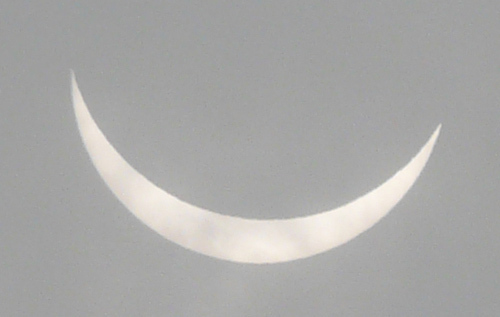 The Sun made a few appearances so we could follow the partial phases through the cloud. 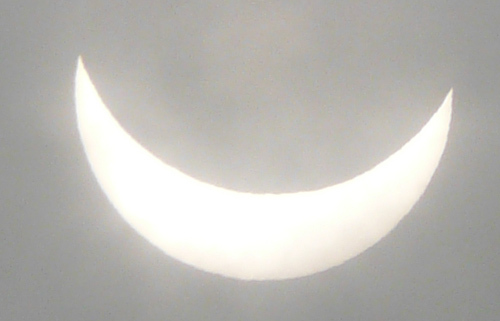 By 9:15 all that was left was a sliver resembling the crescent Moon. Suddenly from the West the Moon's shadow was upon us and it darkened rapidly within about ten seconds. Because of the cloud and the wide shadow (249km), this was pitch blackness rather than the late twilight of previous eclipses. Fish began jumping out of the water in front of us. Nature was reacting to the sudden changes. We looked up - clouds, thick clouds. 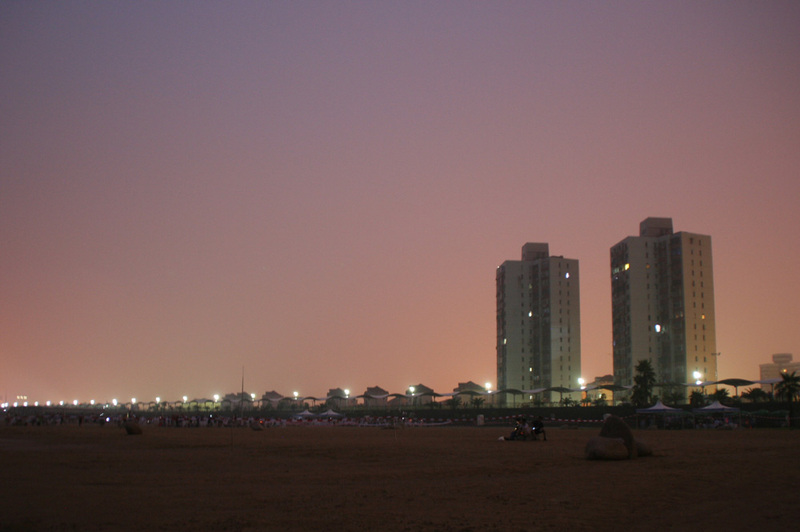 Street lights had come on and formed a line at the edge of the beach. 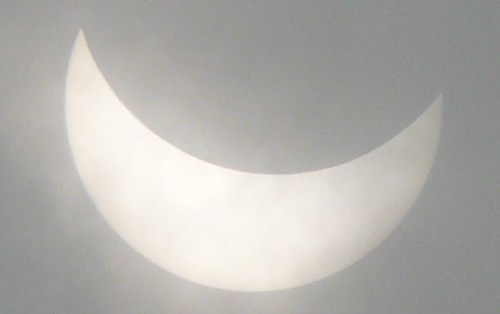 This was a long eclipse, the longest of the 21st century. It was rushing by us and we were missing it. All around was black - the darkest I'd ever known an eclipse. We pleaded for a break in the cloud. Nothing. The West began to lighten up as the shadow was about to pass us. It left us behind as it headed out to the Pacific Ocean, lighting up the day again. We felt bereft as we'd missed a spectacle that has no peers in nature. The first timers had been impressed by the darkness. Experienced eclipse watchers, knowing what they'd missed, felt disappointed. Kryss was able to express his feelings in a mobile phone interview for China Radio International. Group photos were taken. Equipment packed. Then the skies did open: it poured with rain and we ran back to our vehicles for the quiet, wet journey back to Shanghai. This failed eclipse means that Kryss has seen ten eclipses out of twelve. 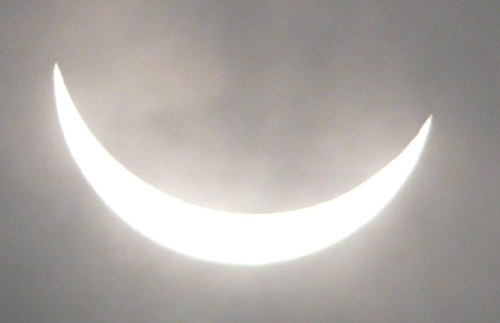 The first clouded out eclipse was in 1999 (Cornwall, UK) so this becomes the first failed eclipse that Kryss has had to travel abroad for. Talaat seven out of nine. We returned to our guest house wet and bedraggled for a hot shower, a dust down, lunch and a sleep. Several of us met in the evening for supper to cheer ourselves up before heading our separate ways. We later found out that the skies had been clearer a couple of hours West of our location. Our companion from the 2008 eclipse, Olga, had seen twelve seconds of totality in Hangzhou, a city two hours by train from Shanghai. India, with a predicted 80% probability of cloud, had had clear skies over the holy Hindu city of Varanasi. The best story we heard was from Lukas (Canada) who had originally joined us at our guest house in Shanghai. Panicking over the weather predictions, he flew out to Chongqing (800km to the West), joined an Italian tour group, promptly left them when he found out they would be seeing the eclipse from a cloudy region on the centre line, hired a taxi to take him just 20km outside the city, and ended up seeing about 4 minutes of totality. With the effort, time and money he put in, he deserved his success. Next one, South Pacific 2010. Looking West as the Moon's shadow passes. The sky turns pink as totality ends. A very dark (but cloudy) totality at Jinshan Beach near Shanghai. 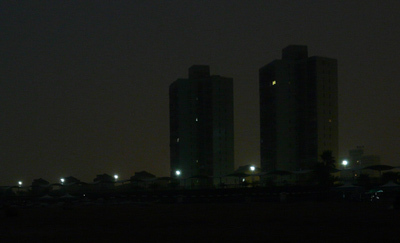 The Moon's shadow envelops Jinshan Beach turning day into very dark night. We joined the long queues for the Shanghai Museum but only had time to see four galleries: jade (excellent), painting (also excellent), calligraphy (ok) and ceramics (very good). Our regular restaurant had given us discount vouchers after our frequent visits so we enjoyed beef with mushrooms and spicy prawns with rice and lots of coconut juice. Our local bank let us photograph the newspapers with their eclipse coverage. A night train took us to the western city of Xi'an (whose name means "western peace"). Xi'an has huge city walls around the centre and we spent the first day exploring a small part of the old city. The Bell Tower and Drum Tower were used in the past to call sunrise and sunset for the merchants. There was a drumming show while we were there. Xi'an was once a great capital and one of the major cities on the silk road. The Muslim Quarter is busy with kebabs and breads which are not typical of Chinese food. The Great Mosque was a blend of Islamic and Chinese styles with gateways glazed with blue tiles and a minaret resembling a pagoda. We took a bus for an hour to the East of the city. Here is located one of China's most famous archeological sites, indeed one of the wonders of the world. 2000 years ago the first Emperor of China (and founder of the Qin Dynasty) was buried in a mound. Guarding his tomb was an Army of Teracotta Warriors, each one lifesize and each one different. They were discovered by accident when a farmer was digging a well in 1973. The site is enormous and we had to do a lot of walking. There are three pits open to the public - each one housed in a grand building. The smallest was Pit 3. This had 72 warriors and horses and was the command post. Pit 2 was larger and had 1300 warriors and horses, many unexcavated. Five of the warriors including a horseman and a kneeling archer have been raised above ground level so we could see them. We joined the crowds for a peek at the detail of these figures. I found the faces were fascinating as they all had individual hairstyles, mustaches, and expressions. Pit 1 is housed in a building that would fit a couple of airplanes. There are 6000 warriors here lined up in 11 ditches. A magnificent and awe-inspiring site. All face east and all are ready for battle. Their weapons, made of wood, have long since rotted but they all look as if they could sping into action at the first command. This site is over 2km from the Emperor's tomb and it is beleived that more soldiers await discovery. In another building are two chariots that were discovered in 1978 closer to the Emperor's tomb. The third day of our stay in Xi'an was raining so we spent it in the Shaanxi History Museum, a repository of the region's treasures. Shaanxi Province can be considered the heartland of China and the place where the country and culture as we know it developed. The Zhou Period (2100 BC - 771 BC) produced bronzes of outstanding quality: lamps, urns, bells, cooking vessels, food containers, wine goblets. All with intricate detail and designs of animals, dragons or ogres. The Qin State and Dynasty (770 BC - 207 BC) were the dynasty that united China - we had already seen their terracotta warriors - now we saw their decorated roof tiles, animal shaped containers as well as non-military terracotta figures. The Han Dynasties (206 BC - 220 AD) developed Chinese culture as we know it today and from them we saw: gold artifacts, painted ceramic horses, standard mesuring jugs. But the highlight was the Tang Dynasty (581 - 907 AD), the longest running of the dynasties whose capital was Xi'an and who set up the silk road for trade with India and Europe: This was the golden age for China while Europe stagnated in the dark ages. Their artifacts included silver and gold incense burners, pots, cups and bowls (all elaborately decorated), ceramic figures of the highest quality: painted musicians, females, officials, horses, celadon dishes of amazing smoothness and delicate translucent colour, bronze items like mirrors and containers. We took a local tour which visited four sites in the region to the West of Xi'an, which is dotted with tombs of various emperors. We began by visiting the Mao Ling Tomb. This is a cone shaped mound 47m high, the burial place of Emperor Wudi, the most powerful of the Han Emperors who died in 87 BC). It is set in a pleasant garden with stone sculptures of animals. The second tomb was of Yi De, a prince. Here we went down under ground through a tunnel painted with frescos showing war scenes. The tomb is in a chamber at the end. Along the side of the tunnel were openings with small terracotta figurines of horses and soldiers, a poor man's terracotta army. Next came the spectacular Qian Ling Tomb. These square structures sit atop two adjacent hills. One is of China's only female ruler, Wu Zetian (died 705 AD) and her husband from whom she took over. This Tang tomb is reached along a wide "sacred way" lined with animals, official guardians and statues of foreign dignitories. The view from the top was impressive. The large Famen Temple was a Buddhist place of worship dates back nearly 2000 years. It has been converted into a huge soul-less theme park over 1km long but there was enough of interest to make a visit here worthwhile. The old temple with its impressive pagoda, pilgrims offering burning joss sticks, and orange robed monks was a great place to people watch. This was set in pleasant gardens and there were many elegant side buildings. In 1981, part of the pagoda collapsed revealing a chamber with over 1000 buried treasures. These are now on display in an enormous new temple several hundred metres away along with the Buddha relicks that the temple originally housed. These treasures were more superb Tang, gold, silver and bronze creations including a ruler, chop sticks and equipment dealing with tea. After our log day out exploring tombs and temples we stayed in bed till noon – check out time. Leaving our stuff in the hotel’s storage, we explored a little more of Xi’an. The city walls are 12m high and stretch for 14km round the centre of the city. They date from the 14th century. We explored a small portion of them. The are certainly impressive, being wide enough for three buses to run along their length. Back in the colourful Muslim Quarter, we visited a restored traditional courtyard house and tried some of the district’s excellent bread. Another night train brought us to Beijing (meaning “north capital”). We stayed in a traditional courtyard hotel in a hutong (old quarter). Our room was decorated with Ming furniture. A short bus ride took us to Tiananmen Square, the world’s largest public square. We saw the Mausoleum of Chairman Mao The best part of the square was watching the people as many visitors from other parts of China were there taking photos of each other. The enormous Forbidden City kept us busy for several hours. It is residence of the Ming and Qing Emperors for 500 years. This was the best preserved collection of Imperial buildings in China. The sheer scale of the place was overwhelming – as were the number of people visiting. We saw some lovely ceramics. In the hills north of Beijing are 13 Ming Tombs. We went to the Tomb of Yong Le, He died in 1424 and he is buried in an unexcavated mound behind a walled complex of halls and gates. Next stop was the Great Wall of China at Badaling. There was hazy sunshine so the scenery was picturesque. We ascended in a cable car joining the eneormous crowds, coach parties, hawkers and souveneer sellers scrambling over and along the wall. The Wall awes as it snakes over the mountains but the place is not tranquil and peaceful. The next day, we went to The Temple of Heaven, a beautiful round Ming building set on a triple terrace. The surrounding park was fun with a rose garden and people dancing tango and foxtrot (ages 7 to 70). A ride on the underground took us to the Tibetan Buddhist Lama Temple with its hoards of pilgrims burning incense and orange robed monks chanting. This was an atmospheric place and the nearby streets were full of incense shops. We met Mark and Lucy (from Beijing's China Radio International) and saw a bit of the capital's night life, visiting a food street with scorpions on sticks as one delicacy on offer. We were also taken to a reconstructed hutong (alley) with trendy shops and restaurants. On our final day we took the underground to the Ancient Observatory. This was sited on an old watchtower from Beijing's long demolished walls. There were a number of beautiful astronomical instruments and sundials and a copy of the observation in 1054 of a star that exploded. Although it was visible for two years (and for one month in broad daylight), Europe, engrossed in its dark ages, mised it. Another underground journey followed by 50 minutes on a bus brought us to the Summer Palace with its lake and pavilions. The most famous item is a marble boat used by Cixi, the mother of "the last emperor", Puyi. Our short trip was over and it was time to return home. Written account and all text descriptions. (© 2009). All programming, video and photo editing. Telephone interview with China Radio International. Photos of partial phases, rocks in sea sequence, tower blocks collage, group and individual photos, newspapers. 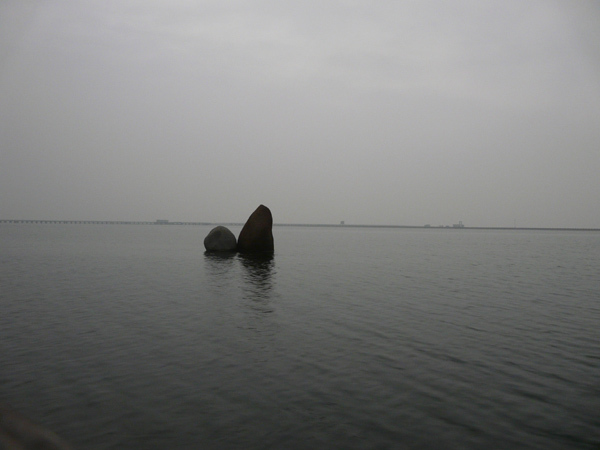 Fixed stand video, photos around Jinshan Beach. Group photos, transport photo, hand held video, umbrella and cakes. Accommodation, help arranging minivans and lots of tea. 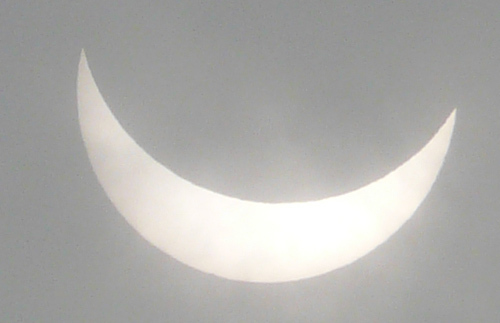 The 2009 eclipse main page. Maps of the path of the 2009 eclipse from Fred Espenak and eclipse details at the observation site. People from the 2009 eclipse. General photos on eclipse day and newspapers. 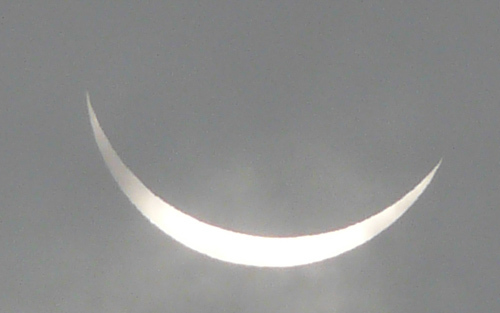 Accounts of the 2009 eclipse sent to this web site.